This album is now on media. 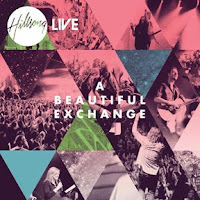 What is shown here is the scene of a Sunday night 8th of November last year where thousands of worshippers gathered together in the Sydney Entertainment Centre in a collective Expression of worship, recording the latest live worship album from Hillsong Church. From the first song you are carried on a journey from awakening to awe for this overwhelmingly infinite and yet intensely intimate God. It is intoxicating captivating what the power of a unified church in worship can accomplish. That night, thousands of people knelt at the feet of their magnificent Saviour in adoration; a beautiful exchange on so many levels. Both the CD and DVD are a complete worship experience. The album features 12 fresh, new songs including the title track Beautiful Exchange, and this year the DVD and Blu-ray comes complete with a special backstage look into the work that goes on behind-the-scenes.